Ten years ago, many organizations were wary or even suspicious of coaching. That sentiment has changed. Coaching has become a preferred learning tool in corporations, nonprofits and in the public sector. You might be surprised who is doing the coaching! There remains a lot of confusion in the marketplace about what exactly is coaching, but organizations, by and large, are attracted to it. And embracing it. A 2014 UK study showed 76% of organizations offer coaching or mentoring. Why the change of heart? A lot of positive results from coaching have been documented. These results, coupled with a global recession where organizations expected more from fewer employees, has catapulted coaching to a preferred method of people development. It’s not just the CEO who gets a coach. Coaching is used at all levels in organizations. Let’s look at last year’s Executive Coaching Survey done annually by Serpa Coaching out of Dallas, Texas. They asked organizations “Who gets a coach?” and sorted answers according to: Top Executives, Senior Managers, and All Levels. 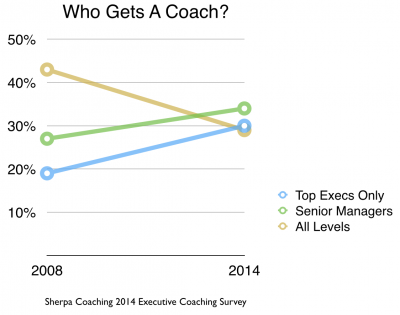 The trend from 2008 to 2014 shows Top Executives and Senior Managers are taking a higher percentage of the coaching. While All Levels has greatly declined. This may seem like organizations are retreating from coaching for those not in Executive or Senior Management positions. But this isn’t the case. Remember this is an Executive Coaching Survey. The coaching people have in mind, are largely executive coaches hired from outside the organization. Other people inside the organizations are now carrying more of the coaching load. Coaching takes place in organizations at several levels and from different types of coaches. There are 3 main types of coaches in organizations. 1. External Coaches. Sometimes called Executive Coaches, these are expert coaches hired from outside your organization. Executives and senior managers overwhelmingly prefer an external coach. Advantages of an External Coach include an outside perspective, a safer setting to discuss sensitive issues, and the coach’s ability to challenge the executive’s assumptions. However, they are often expensive. And therefore these coaches are brought in for those who are considered to be higher leverage employees – executives and senior managers. 2. Internal Coaches. A growing segment of coaches who are professionally trained and qualified as coaches, and are employed by the organization. They function similarly to External coaches, but since they are employed by your organization, they don’t require payment to be made to another company. There are a number of attractive features of Internal Coaches. A big one is the ease and speed of which the organization can deploy them compared to the contracting process of an Executive Coach. Also, as employees of the organization, Internal Coaches understand the organizational culture, politics, and have knowledge of internal resources. A few disadvantages include possible difficulty establishing credibility, lack of outside perspective, and demands from other work roles (unless they coach full-time). 3. Manager Coaches. These are supervisors who use coaching skills in their regular interactions with those who report to them. Although they may not have specific coaching sessions, they listen actively, ask powerful questions, allow employees to set action steps, and then follow-up. This is where organizations are looking for the bulk of coaching for their employees. More and more organizations provide coaching training to equip their managers to coach well. The Manger’s first-hand experience observing the employee in action is a big advantage. Managers are able to have frequent, on-the-job interactions with employees. Some of the disadvantages stem from the reporting relationship: focus on performance, lack of broader perspective, and inconsistent types of interactions with employees. The coaching trend in organizations is toward Manager Coaches and Internal Coaches. External coaches are increasingly seen as specialized and at a premium and therefore often limited to executive and senior managers. In my work with organizations, I begin either as an External Coach to an executive or by providing coaching skills training for managers. Once executives have experienced the benefits of coaching first-hand, they often want to bring more coaching and coaching skills training into the organization. As I train groups of managers and HR folks in coaching skills, most managers appreciate the empowering approach and find it useful for supervising others. They see increased engagement and ownership of responsibilities by employees. Some of these managers feel like a light has been switched on and a whole new world has opened up to them. They jump in and start coaching others in a disciplined way. They get more training and become credentialed as a coach through an association such as the International Coach Federation. They become advocates for coaching in their organization. It’s these “coaching champions” who might be your organization’s first Internal Coaches. The value of Executive Coaches seem obvious to most organizations. The real leverage, however, is in developing the often overlooked Manager Coaches and Internal Coaches. By doing so, you increase your organization’s ability to have broad-based impact through coaching at all levels.